Workshop HTML with students from the first and second year of DOGtime at the Rietveld Academy in Amsterdam, The Netherlands. Workshops HTML/Webdesign at several schools in the Netherlands for children aged 10-12 (group 7 and 8) at several Primary Schools in The Netherlands, as well as a workshop programming for children aged 10-12. In these workshops children are introduced to the basics of HTML. Depending on their personal level they create a very simple or more complicated website in just 6 weeks. 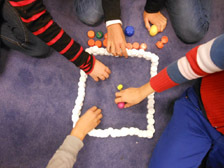 Via many creative exercises, with and without the computer, children discover the logics of programming. 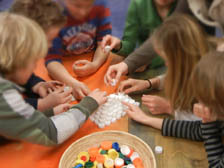 Workshops 'Crea-Recycling' at several schools in the Netherlands, as well as with children from refugees in the Netherlands. Different groups of children, from 6 to 12 years old. 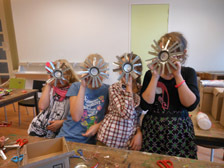 In these workshops children learn to 'work with what they have'. How can you use the materials that are all around you, to create things that are useful, nice and fun to play with? 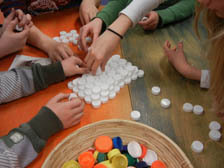 Via many creative exercises the children experiment with finding different possibilities and different solutions to create the things they would like to make with the materials that they have. Workshop recycling and webdesign combined. 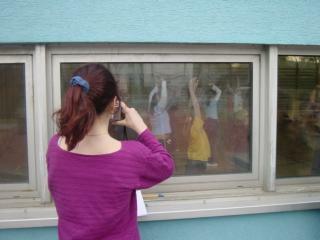 'Exploring the City' with students from the Moving School during Documenta in Kassel, Germany. 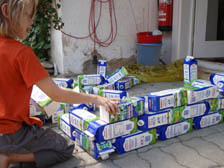 Workshop Crea-Recycling with children aged 6-9 at the ACRYL Women Museum Circus Festival at Pavelhaus, Laafeld, Austria. I had asked the people at the Rietveld for a whiteboard to use during these workshop. When I entered the classroom I found a blackboard with crayons in the room. 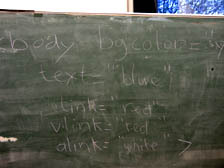 So for four evenings I was teaching HTML to students by writing all the code with crayons on a blackboard. It was a great feeling to do so! 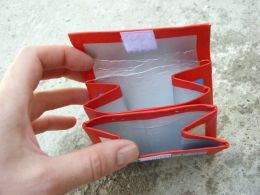 Visitors of the Open Day at our studio in the Netherlands were invited to bring their own empty milk carton and change it into a wallet! 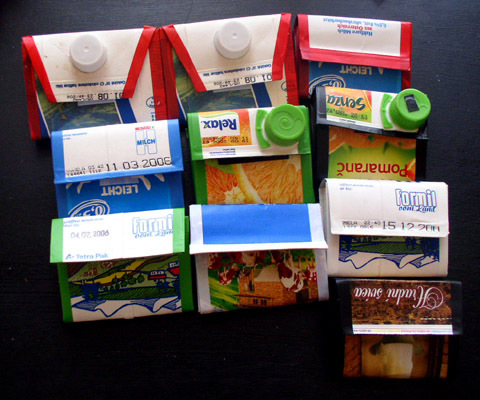 Besides creating a wallet they were invited to create a pyramid with the plastic tops of the milk cartons. Children from a local school came to visit my studio. 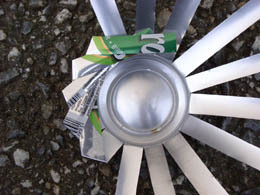 During the short time of the visit they had a short introduction on art and recycling. Of course there was also time to try out some things yourself. Workshop HTML with students from the first and second year of the digital media department of the University of Nova Gorica in Ljubljana, Slovenia. Workshop HTML and webdesign with students from Interaction Design and Unstable media at the Rietveld Academy in Amsterdam, The Netherlands. Workshop HTML with students from the first year of the digital media department of the University of Nova Gorica in Ljubljana, Slovenia. Workshop webdesign at Famul Stuart, University of Arts, Nova Gorica - Ljubljana, Slovenia. In diesem Workshop werden die Basiskenntnisse für die Gestaltung einer Webseite vermittelt. Der Workshop bietet eine Einführung in die technischen Aspekte und beschäftigt sich gleichzeitig mit den inhaltlichen Möglichkeiten. Eine Website zu gestalten, die aus der Inspiration der direkten Umgebung von Pöllau und der freien Natur entsteht, ist das zentrale Thema dieses Workshops. Der Kurs findet somit nicht nur am Computer statt, sondern auch im Freien, im Ort, im Schloss und im Park. Hierbei werden Inhalte gesammelt, die dann als Website verarbeitet werden können. 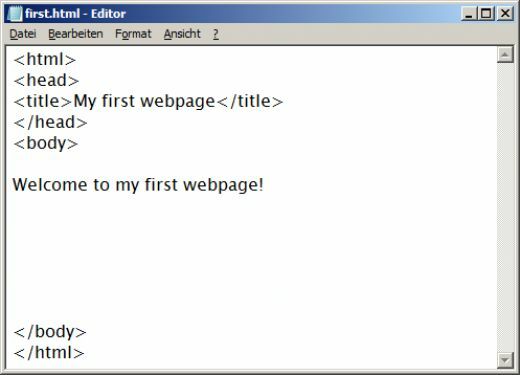 The first articles of a tutorial 'My first website' are now online. The articles cover the first introduction to HTML and web design and present the same material which I explain during my workshops HTML and webdesign. Feel free to visit this free tutorial and if the material has made you interested to learn more, maybe you'd like to participate in one of my workshops. In the workshop Web 2.0 Cym will demonstrate how you can promote your work online using the possibilities of the so-called 'Web 2.0'. For the first time Cym gave her well-known workshop webdesign as part of the Styrian summer_art festival. In her workshops Cym usually motivates the participants to use the local surroundings as a start for creating their first website. Besides carefully explaining all the basics of HTML, she encourages the workshop participants to go for a walk and collect local impressions that, together with the first basics of HTML, will merge into a website. 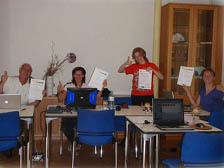 The results of this workshop were presented on July 13, 2008 in the castle in the center of Pöllau. Workshop Flash at Famul Stuart, School of Applied Arts - Ljubljana, Slovenia. 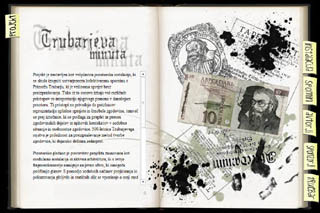 Goal of the workshop was to create a website for the exhibition 'Trubar's Minute', an exhibition about Slovenian writer Primož Trubar. Workshop Webdesign at Famul Stuart, School of Applied Arts - Ljubljana, Slovenia. Workshop webdesign for beginners and workshop webdesign for advanced at Famul Stuart, School of Applied Arts - Ljubljana, Slovenia. 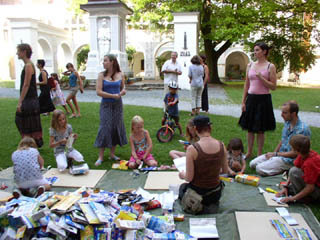 Workshop recycling with children during the closing event of the Styrian Summer Art festival in Schloss Pöllau in Pöllau bei Hartberg, Austria. Workshop webdesign by cym during the /etc in Linz, July 11-15, 2007. Zielgruppe: Kinder ab etwa 8 Jahren, Eltern und andere Erwachsene, Jugendliche. Workshop Flash with students from the first year at Famul Stuart, School of Applied Arts - Ljubljana, Slovenia. Workshop to the theme of 'Underground', creating a Metro (Underground) network for Ljubljana, designed as a website with its main station at the school, downstairs at Bežigrajski Dvor. The main goal of this workshop was to create a website to protect the trees in the Stadtpark in Graz from being cut down by the local government. The workshop participants were very motivated, but I am not sure if the website was ever finished. 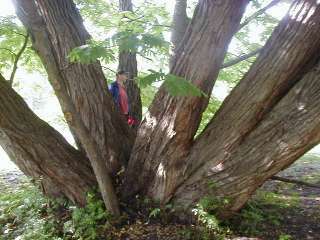 The trees in the Stadtpark were cut down without a reason, about half a year later. Workshop HTML/Webdesgin at the Shark working space at Froum Stadtpark, Graz, Austria. A workshop that started with the question how to connect Forum Stadtpark in Graz and Pekarna in Maribor. The project started as a workshop by Cym, but developed into a big happening in the Stadtpark, including a demonstration 'The city belongs to us' with live music, djs, live actions and a fireshow. As a result of the workshop we built a huge tunnel under the Forum Stadtpark that was a symbolic connection from Graz to Maribor. Somewhere in the middle of the tunnel under the Forum Stadtpark was the border. After coming out of the tunnel on the other side you would find yourself in an atmosphere similar to Pekarna in Maribor, with people around you speaking only Slovenian. 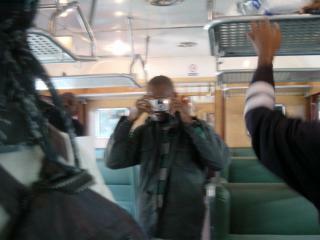 Among the participants during this project were son:DA. 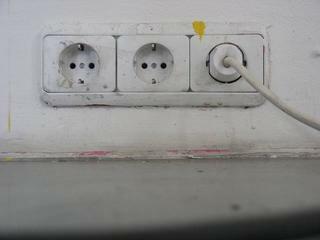 One of their ideas during this workshop was an installation with electric plugs and sockets. They made interesting sketches during the connected project which they developed later into many interesting projects in many different places. 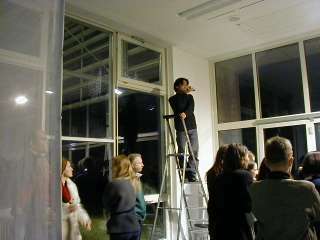 One week presentation of the Shark Working Space at Forum Stadtpark, Graz in March 2003. 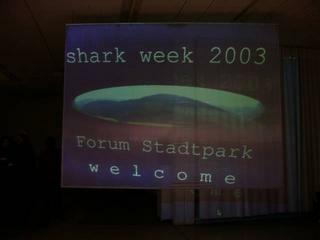 The Shark working space was presented during a one week event with workshops, presentations and discussions, that I organized at Forum Stadtpark in March 2003. The week was opened with a virtual reconstruction of the Forum Stadtpark, made in PD/GEM, that was later used during the Connected 03 Workshop in Summer 2003. This is the beginning of the 'Shark Arbeitsraum', the workingspace that I set up at Forum Stadtpark. 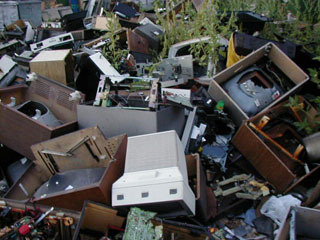 The computers were donated for creating a social working space with free internet connection. For about two years I was maintaining the working space with the name 'Shark' at Forum Stadtpark. Later I donated the computers to the African restaurant NIL, a project that emerged from the Baodo group. In NIL the machines were just standing around because nobody wanted to use a linux machine, until I picked the machines up again about a year later. Only one of the machines is left now, and will be used in the connected:07 project at Wd8 in September 2007. The Shark working space was presented during a one week event with workshops, presentations and discussions, that I organized at Forum Stadtpark in March 2003. Workshops with members of the African artist group 'Baodo'. A continuation of the workshop HTML and an introduction to 'GIMP', the GNU Image Manipulation Program. 5 weeks in February and March 2002. Workshop HTML/Webdesign with 14 girls aged 13/14 at secondary school b(r)g Carneri in Graz, Austria.We used the school building as theme for the website and as part of the workshop we were going around the school photographing their favourite places and corners in the building and of course photographing the spaces where pupils were usually not allowed to enter. Remake of the Shadow Casters workshop in Summer, this time in Bologna, Italy. It should've been as nice as the workshop in Zagreb, but you cannot recreate an atmosphere. It was winter in Bolonga, it was so cold and the streets were full of hectic people doing their last-minute Christmas-shopping. But nonetheless we tried to make the best out of it. Somehow i don't remember much of this workshop.. but i hope that the students learned anyway how to make a website..
We stayed a few more days in Bologna after the workshop. 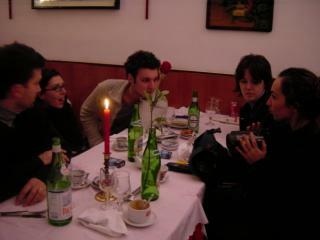 The nicest part of this small holiday was probably the escape to Rimini for an afternoon on December 28, 2001. Workshop HTML/Webdesign with members of the african artist group 'Baodo'. 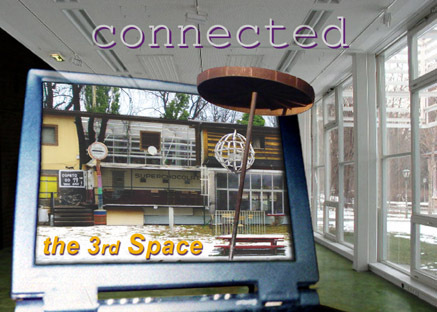 This workshop was given in the computerspace of the refugee house in Graz where most of the participants were living at that time. We used the Stadtpark in Graz as main content for the webpages. 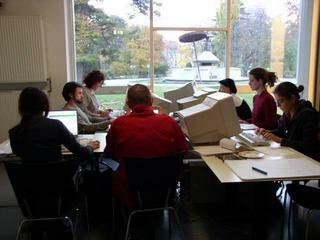 We presented the websites during an event at Forum Stadtpark on October 02, 2001. Following the presentation in Graz we were invited to Linz to present the websites at Kunst Raum, on October 23, which was a very nice excursion for all of us. 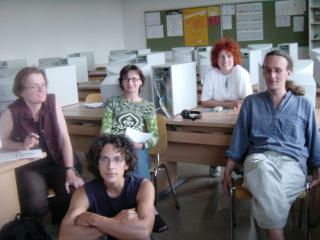 Workshop HTML/webdesign as part of the 'Shadow Casters' project in Zagreb, Croatia - July 2001. In this workshop we were exploring the city of Zagreb and transforming the experiences into a website.The total project was a combination of video, webdesign and theatre. The workshop took time in the middle of Summer and on one of the afternoons it was so hot that i decided to take the students to the park instead of spending the day in the computerspace. We had the workshop webdesign in the park that afternoon. I asked the students to collect materials found on the street on the way to the park. 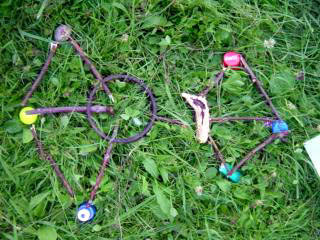 We used these found materials together with branches found in the park to create and discuss different structures for the navigation of the website. Workshop at Ressidorf, Graz, a village made from containers for homeless people in Graz. After collecting old computers and setting up a small computernetwork for them we showed them how to make a simple website. Workshop HTML/webdesign with local inhabitants of a small village in Upper Austria called 'Ibm', as part of the project 'Webversenken/Sink the Web' during Festival der Regionen 2001. The project lasted more than a month. Three different groups of people contributed to the website: the children from the local school, the artists living in the area and a group of writers/poets. Each group had a different section. 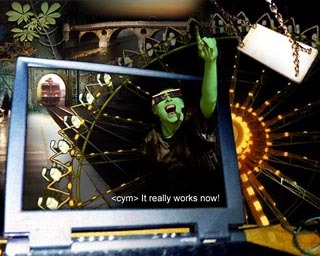 The main frame for the website was created by cym. The first page is ramdomly put together from three contributions, one from each group. We had to split the participants into 2 groups. 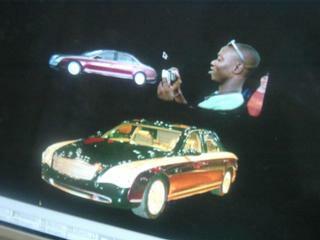 And since then I have been doing workshops HTML/Webdesign regularly at all different kinds of occasions. 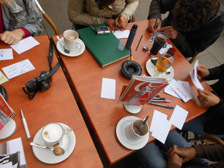 We connected this workshop with the Artist in Residence project of a group of Japanese artists that was taking place in Forum Stadtpark at the same time, which gave the participants of the workshop a lot of nice materials to create their first webpages. Workshop HTML/webdesign with pupils of the local secondary school in Odzak, Bosnia & Herzegowina - December 16-22, 2000. Main goal of this project was to construct a multi-media classroom in the school with old computers that we had collected before in Austria. As part of the project we did a workshop webdesign with the students. We asked them to create a website about their town, Odžak, especially describing what they think could be done to make the very destroyed town a better place again. Almost all of these kids spent a big part of their youth in Germany before returning to Bosnia after the war. They were very enthousiastic to write the texts on their first website in German. The stories on this first simple website were all written by themselves. My very first workshop HTML at MKC and PINA in Koper, Slovenia. We started outside in the garden and then moved to the computers in the PINA center. One of the workshop participants was Rahel Zweig, who made some very nice pages during this first workshop, which described the Koper-hEXPO atmosphere very well. My very first workshop HTML took place in April 2000 at Radio Študent. Nonetheless I was asked to repeat my workshop HTML during hEXPO that summer. 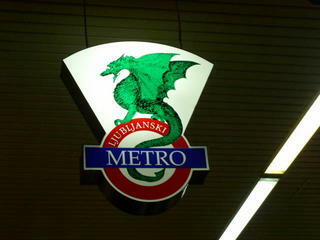 So my very first 'real' workshop HTML took place in August 2000, in Koper, Slovenia.